Al-Khayshoom : means the nasal passage. The nasal passage is the 17th and last makhraj to be studied. It contains only one point of articulation. The nasal passage is similar to the jawf in that is an “open area”, but within the nose. 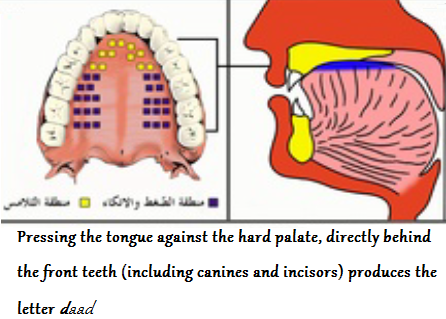 From this area, a ghunnah is produced, noting that the tongue has no part in producing the ghunnah.. It’s important to understand that a ghunnah is not a letter, rather, it is a fundamental characteristic, or quality, for the letters noon and meem as it is part of their original makeup. It is sounded whether these letters have a fat-ha, dammah, kasrah, shaddah, or sukoon. 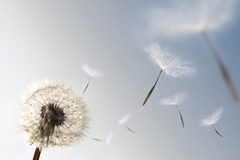 Likewise, it is also sounded when doing idghaam, ikhfaa’ or ith-haar. To understand how ghunnah works (and its significance), block your nose completely by pinching it with two fingers, then try to say a word with the letter noon or meem, or simply sound the letter ( أنْ ) or ( أمْ ). You’ll notice that you are unable to sound these letters properly without the nasal passage being open (and producing ghunnah)! So, this wraps up the 17 makhaarij al-huroof, with just a couple of very important points to make. Second, note there are 28 letters in the Arabic alphabet, however, there are 31 huroof al-tajweed (tajweed letters). The extra letters are hamzah, consonant yaa’, and consonant waaw. Keep an eye out for the upcoming topic, sifaatul-huroof: the characteristics/qualities of the letters. The keepers of secrets, the seal of the mouth, the produces of baa’, meem, waaw and faa’ … you’ve only one option: stash away that lipstick, ladies, and beautify your lips with the letters of the Qur’aan! Al-Shafataan: the lips are the makhraj (point of articulation) for four letters. There are two main areas within this makhraj; they are as follows. The letters baa’ and meem emerge from pressing the lips together. However, the consonant waaw emerges by opening the lips slightly and bringing in the sides to form an “o” shape. These four letters ( ب و م ف ) are all named Al-Ahruf Al-Shafaweeyah  because they emerge from the shafataan, i.e. the lips. Certainly, you’ve all been hard at work, stretching, pulling, warming up and cooling down with the previously mentioned Tongue Buffing Exercises: “Makhaarij Al-Huroof: Al-Lisaan”. Now it’s time to step it up and look at what you can do with the tip of your tongue. Al-lisaan: contains makhaarij for 18 letters. These are divided across 10 points of articulation, which are categorised as 4 main areas. These are: Aqsal-lisaan; Wasat Al-lisaan; Haafat Al-lisaan; and Ra’sul-lisaan, or Tarful-lisaan. 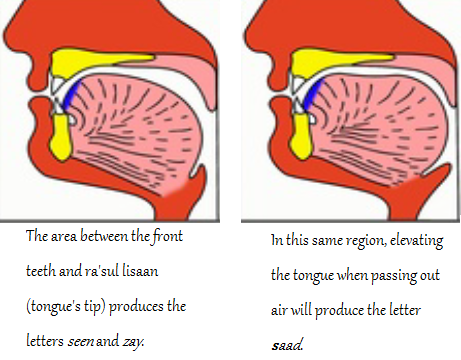 I’ve covered the first three areas in a previous post; below are the letters which emerge from Ra’sul-lisaan  (the tip of the tongue). 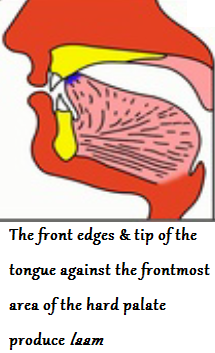 First, it is important to note that ra’sul-lisaan is the very tip of the tongue, and tarful-lisaan  is that small portion of the tongue just behind the tip. This is illustrated in the diagram below. This post covers both these regions as they are generally considered to be one main area. 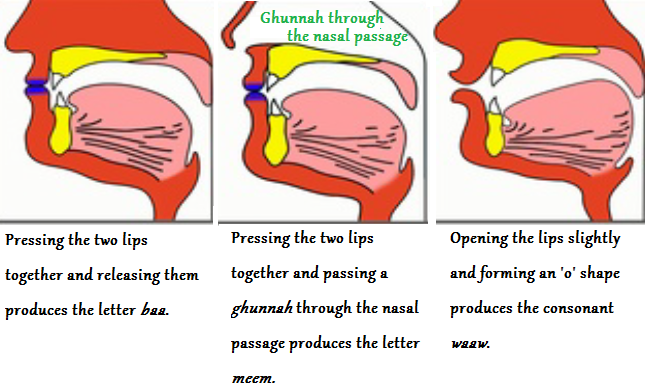 with note that a ghunnah passes through the nasal passage to complete the sound for noon. is produced. The area referred to in the hard palate is slightly off that area which produces noon, as comparable in the diagrams above. The letters noon ( ن ), raa ( ر ), and laam ( ل ) are called Al-Ahruf Al-thalqeeyah . Note: laam was covered in a previous post. The reason for this name is because they are produced from thalq al-lisaan , i.e. it’s tip. Here’s food for thought: did you know that thalq also means “slip”. When your tongue “slips” and you let out a secret, it happens so fast. 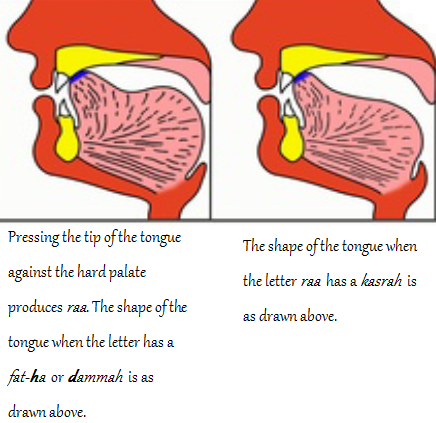 Thalq is just another characteristic of the tongue. It “slips”quickly after producing the consonant letter in a direction respective to a fat-ha, dammah, or kasrah. 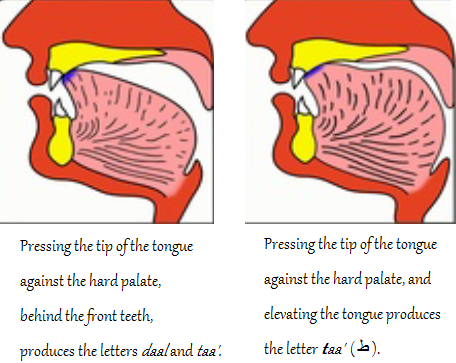 With note that the letter taa’ ( ط ) leans against the front teeth slightly more than taa’ and daal because of the strength needed in producing its sound. These three letters are called Al-Ahruf Al-Natee‘ah  because they emerge from the “skin” i.e. nat’ or “gum” which covers the upper back of the front teeth. 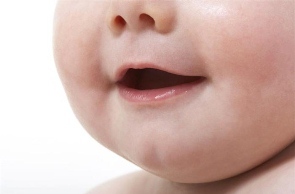 These three letters are called Al-Ahruf Al-Lathaweeyah  because their point of articulation is very close to the gums of the two front teeth.